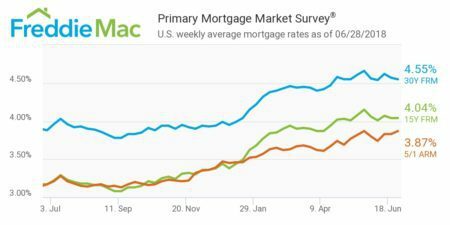 Freddie Mac released its latest Primary Mortgage Market Survey (PMMS) results Thursday, which revealed that mortgage rates have dropped 0.2 percentage points week-over-week to 4.55 percent — the fourth decline in the past five weeks. Freddie Mac Chief Economist Sam Khater says mortgage rates have stabilized over the past two months, a piece of good news for buyers who still have to grapple with exorbitant home price growth. “The decrease in borrowing costs are a nice slice of relief for prospective buyers looking to get into the market this summer,” Khater said in a press release. Realtor.com Chief Economist Danielle Hale also offered commentary on today’s report, saying although short-term rates have steadily risen, the lack of growth in longer-term bond rates has kept mortgage rates steady. “After nearing 3 percent just two weeks ago, 10-year treasury rates finished yesterday 15 basis points lower at 2.83 percent,” Hale said in an emailed statement. Much like Khater, Hale says buyers should enjoy these declining mortgage rates. But she said buyers need to be cognizant of future hikes and keep the full picture in mind.